As part of the S3 program, we have events designed to expose students who are interested in STEM to the kinds of opportunities that are available to them in different fields and disciplines. Three students from the natural sciences presented recent research projects as part of our lunchtime talk series open to all students. Dalton worked on a project that seeks to explain the mechanism that zebrafish use to regenerate fins. Dalton Stewart spent the summer at the University of Oregon in the Research Experience for Undergraduates Site program in Molecular Biosciences. Dalton worked on a project that seeks to identify molecular mechanisms that enable zebrafish to regenerate fins by editing the genome. Dalton’s group is using a brand new technique that is still being studied called CRISPR/Cas9 Genome editing. Dalton’s work was particularly important because this technology is so new that protocols for best practices have not yet been developed, so he was able to try different techniques and assess their effectiveness. Dalton credited the faculty at Maryville College, and specifically Dr. Jennifer Brigati, and Dr. Jerilyn Swann for helping him find and apply for a summer research position. Mary Feely received a Ledford Grant from the Appalachian College Association to perform research related to her senior study. Mary’s research is part of the same project Maryville College alumnus David Lee Haskins worked on in the summer of 2013. The collaboration with Grand Valley State University involves research on the density of American Marten prey in the Manistee National Forest. The American Marten was extirpated from the Lower Peninsula of Michigan in the early 1900’s and was reintroduced in the 1980’s, but the current state of the population is not well understood. As studies have shown that carnivores follow their prey base, Mary’s work strove to examine the available prey base in four different habitat types marten were known rest in. Mary’s work included trapping small mammals that serve as prey for the martens. By using a variety of traps, she was able to show that there is high species richness of prey animals. 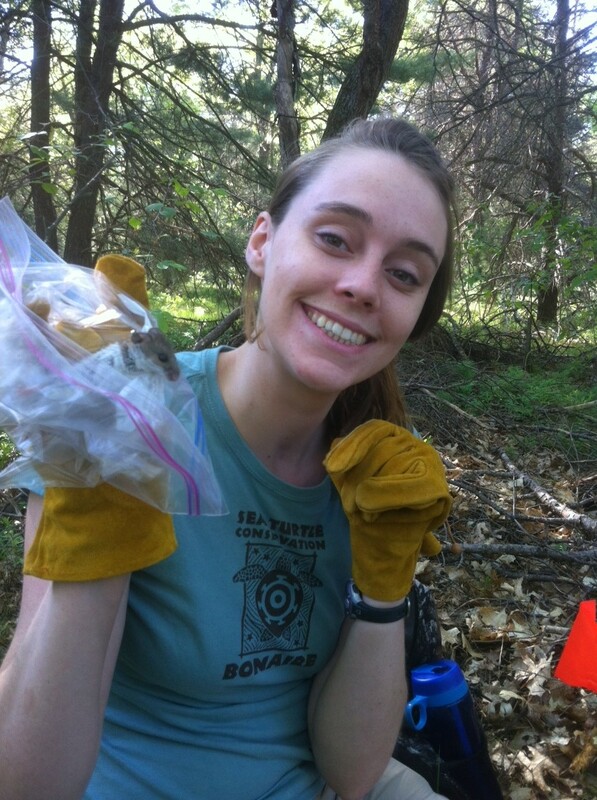 She found that deciduous habitats were the highest in diversity and density in small mammals and thus should be one to conserve by the parks service. Mary credited her Maryville College course in Ecology and Evolution taught by Dr. Dave Unger for preparing her for some of the techniques she employed during her work including GPS and ground telemetry. This work will continue through the year as Mary completes her senior study and presents her results at the Appalachian College Association Summit and the American Wildlife Society conference. Senior biology major Lauren Bonee’s work was also funded by a Ledford grant from the ACA and began during the travel study course to Bonaire led by Dr. Unger. 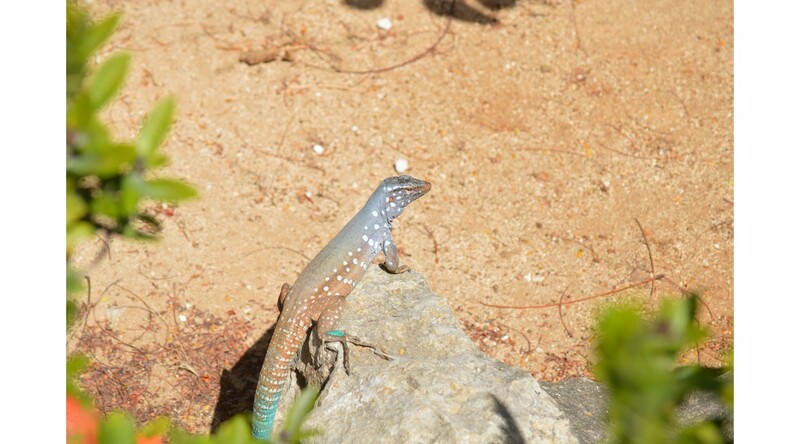 As the island undergoes changes due to human development, it will be important to study the effects of those changes on endemic species like the Bonaire whiptail lizard. 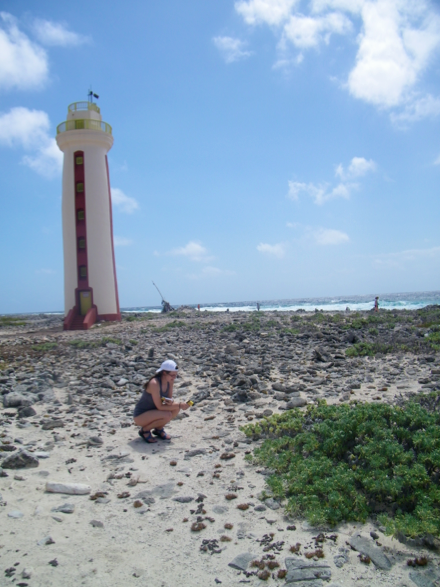 Lauren Bonee collects data on the island of Bonaire. These lizards regulate their body temperature through the environment and specifically by basking in different locations. Lauren was interested in whether these lizards have preferred basking substrate. To determine the answer, Lauren spent hours observing the animals and employed an infrared laser thermometer to measure their body temperatures as they basked on a variety of substrates. She will spend this semester working on data analysis to finish up her senior study. She expressed her appreciation for the opportunities that Maryville College biology had given her to learn, travel, and be inspired to pursue research in ecology. Throughout the semester, we will be hearing from more MC students about their summer experiences, both in research projects and internships. This entry was posted in Uncategorized and tagged Bonaire, herpetology, Manistee National Forest, Maryville College, Microbiology, National Science Foundation, Research Experiences for Undergraduates, STEM, undergraduate research. Bookmark the permalink.